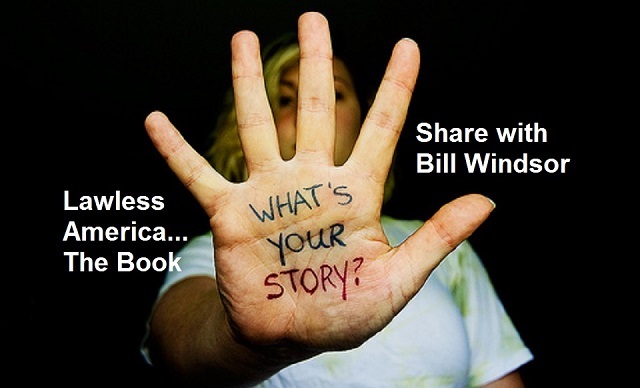 Bill Windsor of Lawless America invites your story of INjustice for Lawless America...The Book. As Bill Windsor continues efforts to get Lawless America...The Movie into theaters, he has been working on a book about his travels and efforts to expose INjustice with people from every state. ...here's what you need to do. Basic Information: Your full name, Your street address, Your city, Your state, Your zip, Home Telephone, Cell Phone, Business Phone, Fax, Best email address for you, Website (if any), Age, Marital status (if applicable to your story), Spouse or significant other’s name (if applicable to your story), Children’s names and ages (if applicable to your story), Occupation, Title (optional), Employer (optional), Names and contact information from any witnesses who might be helpful in corroborating your story (optional), Names and contact information for people who have made you a victim (optional). 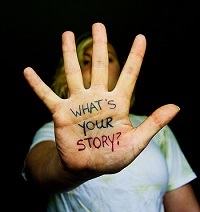 Your Story: Type your story in 1,000 words or less. If you type it in Microsoft Word, you can get a word count. Then copy and paste it into the email. I will be sharing stories from all across America of judicial corruption, law enforcement corruption, government corruption, attorney dishonesty, and liars. Please send no more than 1,000 words. Longer submissions will not be considered. Feel free to name names, especially the judges, law enforcement officials, and government officials involved. Please use their full names. 2. Sign an affidavit in front of a notary swearing that everything in your story is true and correct based upon your personal knowledge. Please be very careful. If you KNOW something is true, then say it. If you BELIEVE something is true, write "Upon information and belief...." Use the attached Affidavit Form. Fill in the blanks. Attach Your Story as Exhibit 1. Go to your bank, and get it notarized. Keep a copy for yourself, and mail the original notarized copy to: Bill Windsor, 110 East Center Street #1213, Madison, SD 57042. Mail it as I need the original of your signature and the notary verification. I also can't risk opening attachments to emails. This request for information applies to everyone -- those previously filmed for Lawless America...The Movie and everyone new. Lawless America...The Book will tell the story of the efforts of thousands of people to expose judicial corruption, law enforcement corruption, government corruption, attorney dishonesty, and liars. I want to include stories from every state. The goal is to spread the word about the devastating problem of INjustice in America. You can see the types of stories that will be included at www.YouTube.com/LawlessAmerica, and you can read the types of stories that will be included at www.LawlessAmerica.com, www.facebook.com/billwindsor1, and www.twitter.com/lawlessamerica. This material is a little dated, but it provides background on the Lawless America Project.